B2B Solution with follow features as given below. We can provide Consumer base API ALSO for All recharge Solutions. website & App cost is extra as per your demand. Single mobile recharge software is a software that can be used to recharge mobile of any company and DTH. Mostly recharge shops used to keep a number of mobile phones with sim to recharge their customer's different service provider related phones. 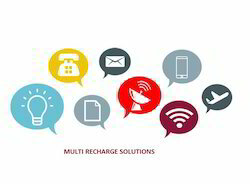 We providing multi recharge software at very low cost with all advance features. Ø Online and Offline Recharge (Recharge complete in 4-7 seconds).